Dental implants can provide artificial teeth that look natural and feel secure. 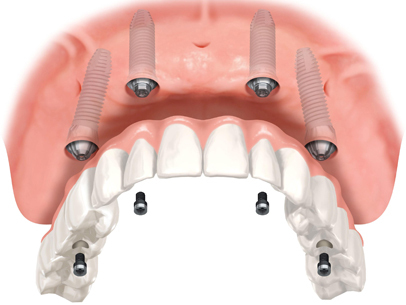 Dental implants can also be used to attach full or partial dentures. Implants, however, are not an option for everyone. Because implants require surgery, patients must be in good health, have healthy gums, have adequate bone to support the implant and be committed to meticulous oral hygiene and regular dental visits. If you are considering implants, a thorough evaluation by Dr. Boehly will help determine if you would be a good candidate. First, surgery is performed by a specially trained dentist to place the implant. The amount of healing time required is case specific. It can be as quick as six weeks for ideal cases and can be up to six months for more difficult situations. After the gums have had several weeks to heal, the next step is begun. The artificial teeth are made and fitted to the post portion of the anchor. For 1-3 teeth replacements the work may be completed within a couple of weeks. For larger reconstructions, several fittings may be required. So this step can take one to two months to completed. Implant surgery can be done either in a dental office or in a hospital, depending upon a number of factors. A local or general anesthetic may be used. Usually pain medications and, when necessary, antibiotics are prescribed. Dr. Boehly or the prescribing surgeon will give you instructions on diet and oral hygiene.